A saucer-shaped spacecraft that would allow Nasa astronauts a bit more room on the way to Mars is undergoing preparations for launch off the coast of Hawaii. 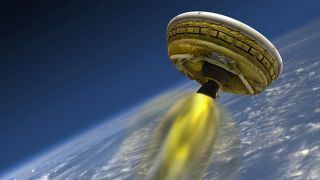 Nasa's "Low-Density Supersonic Decelerator" will be attached to a huge high-altitude weather balloon. That balloon will carry it to a height of 36,500 metres - above the thickest part of the atmosphere - before it detaches and its rockets activate, pushing it to a velocity more than twice as fast as the speed of sound. It's not the first time Nasa has tried to fly the craft. The agency successfully test-launched a previous version last year but a key component - the largest supersonic parachute ever flown - did not perform as planned. Numerous improvements have been made to the design since. "This year's test is centered on how our newly-designed supersonic parachute will perform. We think we have a great design ready for the challenge, but the proof is in the pudding and the pudding will be made live for everyone to see," said Nasa's Mark Adler, the programme manager for the craft. "You get to see all the same video I do, at the same time I do." If you'd like to watch the launch, you can tune in to Nasa Television or JPL's Ustream channel. Live commentary on the launch will begin at 1pm EDT / 6pm British Summer Time.